It's that time of year. Either HATE winter or enjoy it. If you plan ahead, we'll help you with the latter. 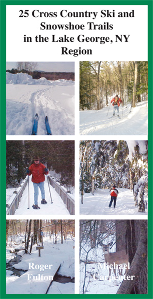 We provide you with 25 Cross Country Skiing and Snowshoeing areas in the Lake George, NY Region in our book. Written in 2007, it is still up-to-date with the best winter recreation areas of the region. Most are free! So, JOIN winter, don't HATE it! This book is available at most EMS stores in the area or through http://www.rogerfulton.com/.